During his eight years as president, Barack Obama appeared in scores of brand ads, illicitly, without White House approval, and in exactly one approved endorsement ad for the Financial Times. All of the ads featured him as a positive creative linchpin. After only two years, President Trump would probably be happy to know he is on pace to easily overtake Obama as the most popular borrowed interest ad president ever, even if he only serves one term. He’s already appeared in well over 50 brand ads worldwide, none of them official. But almost all of them have used him in a negative light. 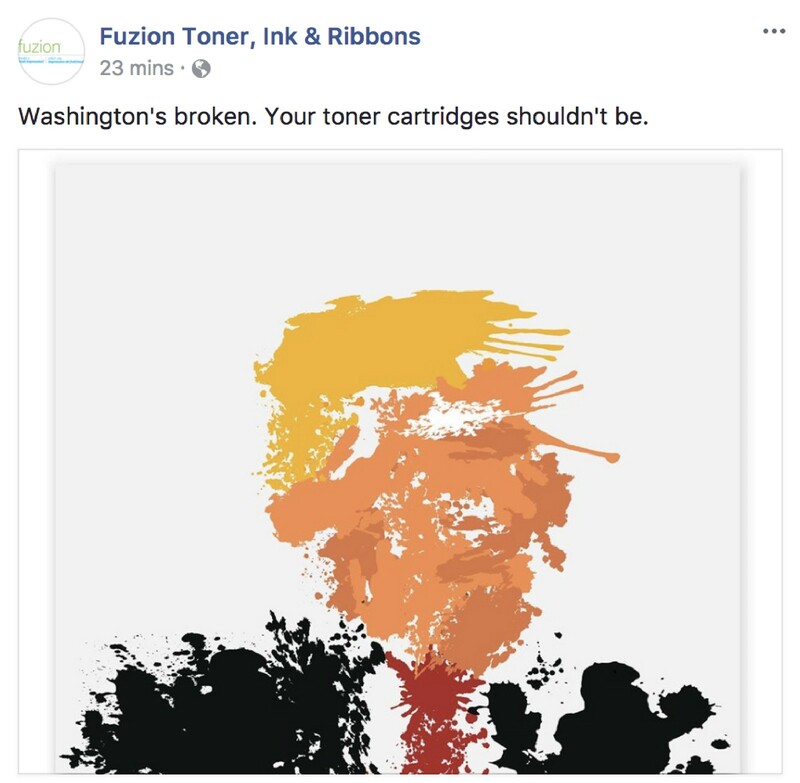 So far, Trump has been used to sell everything from the Salvation Army to Sushi to toner cartridges. Here are a few of the best examples. Translation: “It may not be perfect for you, but it’s perfect for us”. The artwork makes this execution a winner. Ad is from April, 2018. 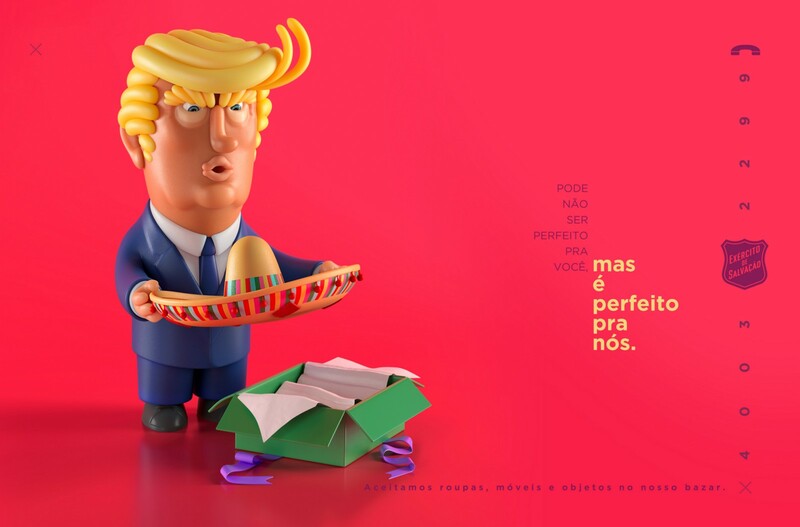 Agency: McCann, Brazil. As the press note states: “Constructivist art is an art movement with a strong emphasis on abstraction”. Ad from October, 2017. Agency: Ruf Lanz, Zurich. I love layouts that show product benefits without showing the product. Ad from September, 2018. 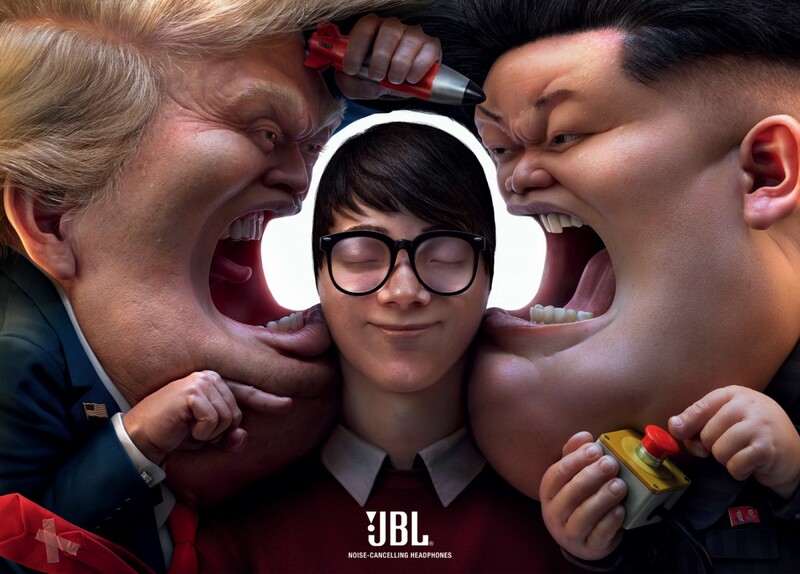 Agency: Cheil Worldwide. Headline: “Small Spaces For Your Big Secrets”. In the zoom-in (right), you see a man who resembles Trump with boxes of blonde wigs and MAGA hats and hairbrushes(?). From December, 2017. Agency: Rethink, Montreal. 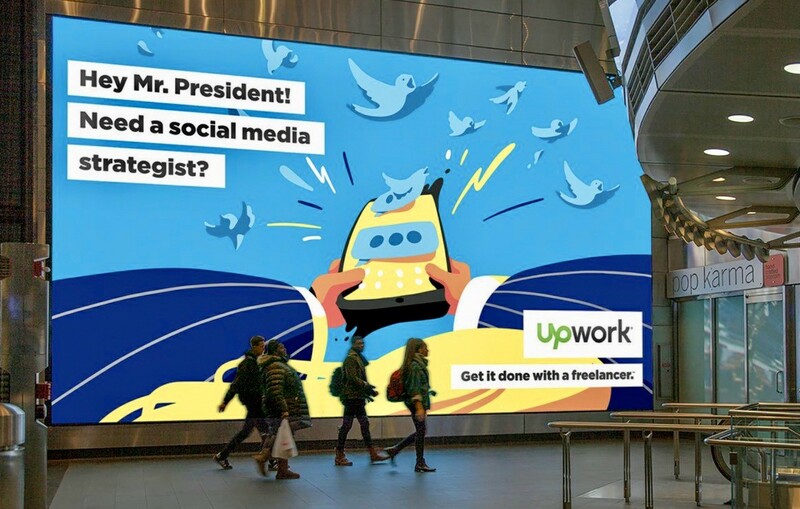 The freelance website launched an out-of-home campaign in January, 2018. This Trump execution was the best of the lot. Agency: Duncan Channon. 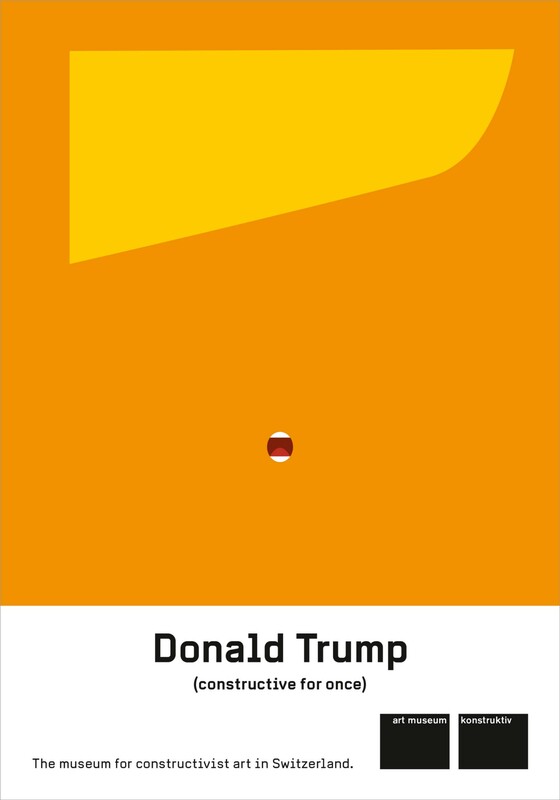 Several brands have tried to use Trump’s iconic hair as a riffing visual. This is the best, so far. 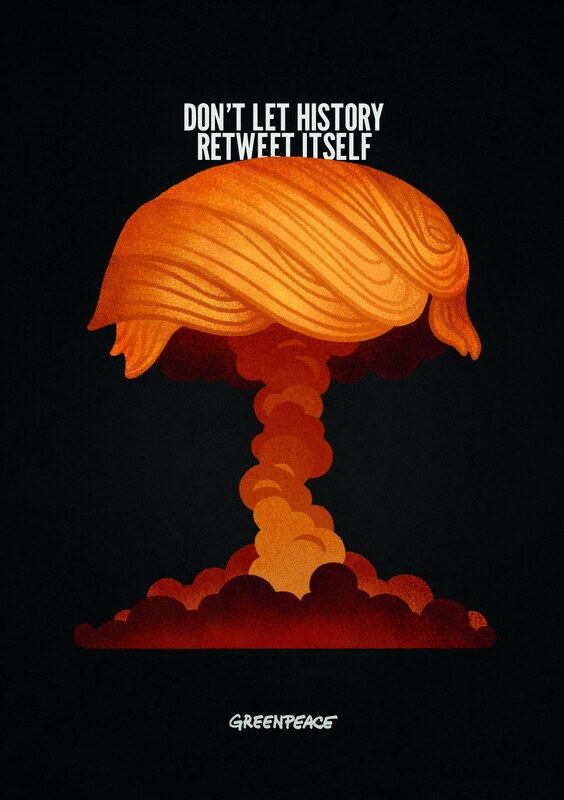 Poster ad from November, 2017, placed on Greenpeace’s social websites. Agency: Hjaltelin Stahl, Denmark. Back in Jaunary, 2018, Trump reportedly said he wanted to ban immigrants from “shithole” countries like El Salvador and Haiti. Smartly and quickly, Port Au Prince ad agency Parkour Creative comped up these speculative tourism ads and started a GoFundMe campaign to raise money to place billboards in the D.C. area. They’re still far short of their $40,000 goal. But the free press coverage they got, online and off, has made the funding moot. Left (via the country of Georgia): “Durex Lubes. Get in anywhere. Really. Anywhere”. Right: I found this fake billboard here in January, 2018. Eight months later, Trump was backing a boycott of Harley-Davidson after the manufacturer threatened to move production overseas. If I was the company’s CMO, I’d blanket the country with this. But some of the “borrowed interest” executions were a bit too borrowed, and whiffed. A few examples below. 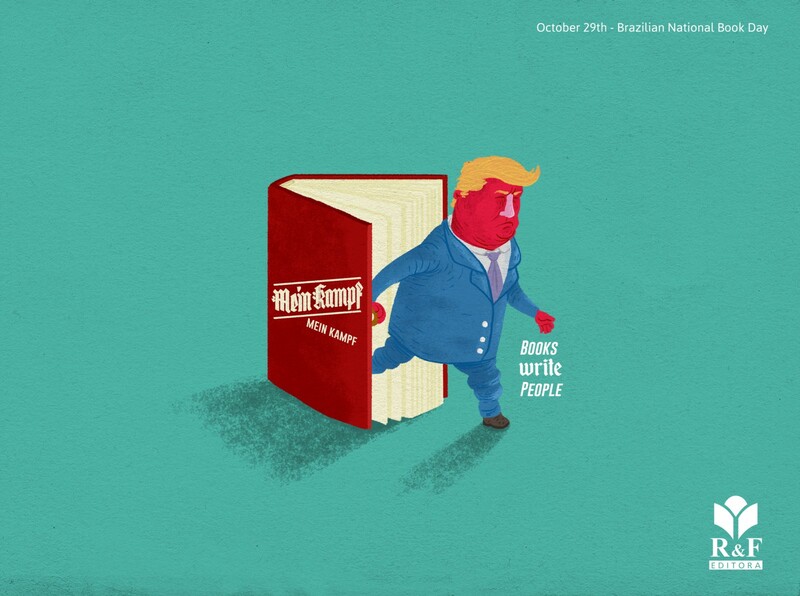 The Brazilian bookseller ran this ad in 2017 to promote National Book Day. “Books Write People”. Hitler is actually the most used world leader in advertising history, and in most of them, he’s misused. (Mind you, this is NOT a political blog post.) Agency: Agência Espaço. Woah, way out of DEEP left field. Fuzion posted this image ad in their social media feeds in January, 2018. Agency: Agency59. The online news magazine website’s tagline is: “The Best Of Slow French Journalism”. 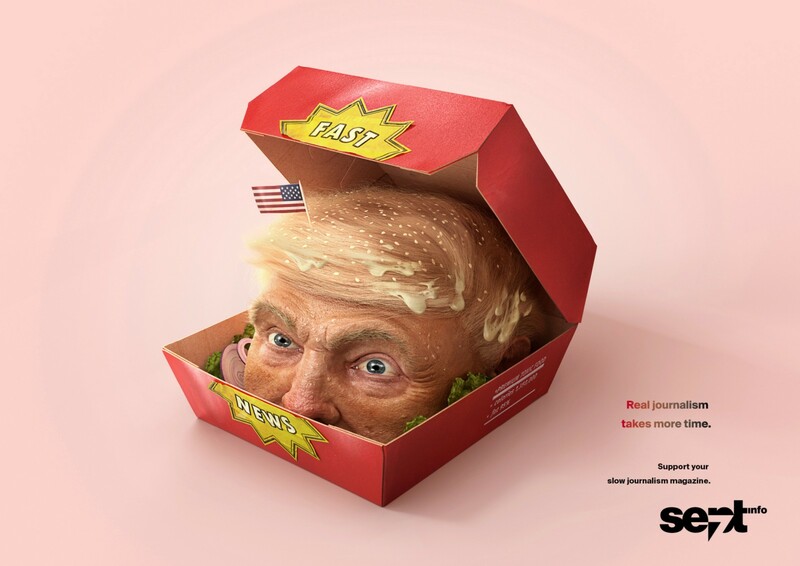 The Trump burger with mayonnaise hair is a compelling sight. On second thought, I maybe like this one. Flag unneeded. From January of this year. Agency: Cavalcade, Geneva. Earlier this year, Agency TDA Boulder used Trump Tweets on billboards near Hapa locations with the copy line: “Eat well before it all ends”. This is a too generic use of Trump. You could replace “Eat” in that line with several other verbs and use it to sell scores of other products. Copy: “The radio (station) that plays the news.” (The ad is translated from Portuguese.) CBN is an all-news station in Brazil. 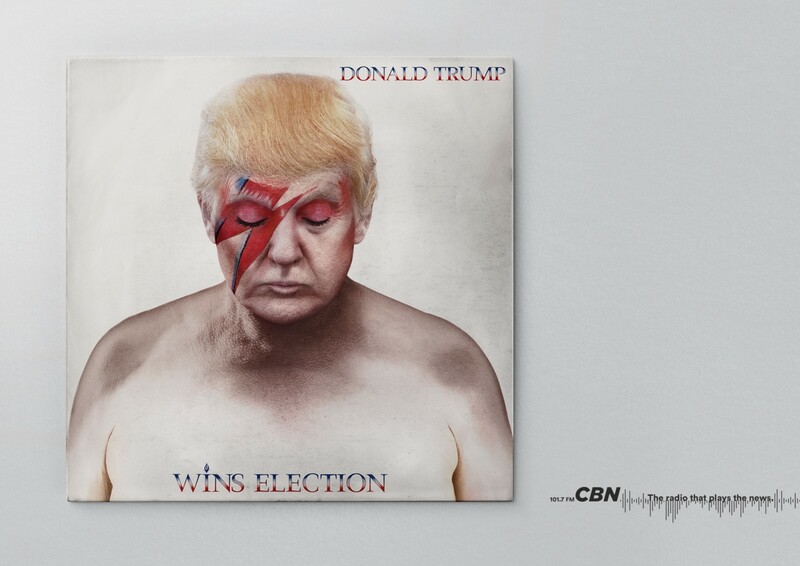 Trump has been adjusted to look like David Bowie on his 1973 album “Aladdin Sane,” except they butchered the lightning bolt and forgot the teardrop — an absolutely horrifying visual. From 2017. Agency: Agência UM, Recife. 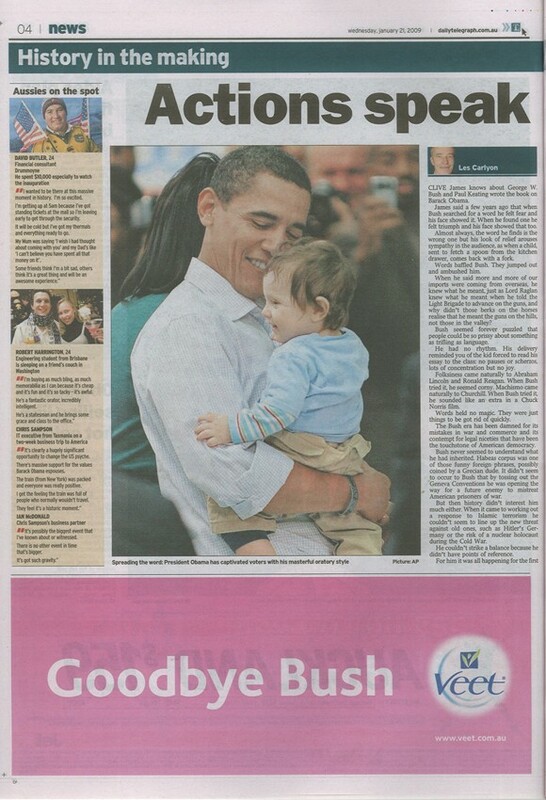 ENDING NOTE: President George W. Bush appeared in a few ads (all as a negative linchpin) during his eight years, most notably this post-election January 2009 Veet hair removal ad (by Euro RSCG, Australia). Copywriter/Ad Critic. My hockey wrist shot is better than yours.